grandma's cookie jar: just for fun - It Is Pie Day - Enjoy a Slice for FREE! just for fun - It Is Pie Day - Enjoy a Slice for FREE! about pie??!!! Sweet pies or savory pot pies . . . in my opinion, it is difficult to go wrong with pie!!! Just for fun, I thought I'd "search" the web to look for any Pie Day "specials" and found a few . . . if you live in or near any of the following places, see if you can make it to these bakeries/resturants and enjoy some FREE pie! Grand Traverse Pie Company . . . they have fourteen locations; mostly in Michigan, but one in Indiana as well. Today only, you can receive one FREE slice of fruit pie with any purchase! (I think I hear blueberry pie calling me!) See more tasty details at this link! Celebrate National Pie Day by trying all 28 varieties of Miles Farmers Market’s pies. The store will be offering free samples from 9 a.m.-6 p.m. Saturday, Jan. 25 and Sunday, Jan. 26, as well as giving away store gift certificates and other special prizes. Come test your bakery knowledge with pie trivia or just eat your way through more than two dozen varieties of pastry goodness. Miles Farmers Market is located at 28560 Miles Road in Solon, OH. Call 440-248-5222 or go to milesfarmersmarket.com for more information. Norma's Cafe Free Slice - For the fifth year in a row, all three Norma's Cafe locations in Dallas will be offering one free slice of its famous Mile-High Cream Pies on Jan. 23, 2014, from 6:00 a.m - 8:00 p.m. for dine-in customers. No purchase is necessary. 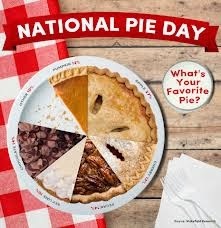 Baker's Square - Every day is pie day at Baker's Square in Minnesota, Wisconsin, Iowa, Illinois, Indiana and Ohio! Get a free slice of pie every Wednesday for Pie Rush Weds. And in honor of National Pie Day, participating locations will be offering $2 discounts on whole pies for in-store orders between Jan. 20 and Jan. 24, 2014. Eckert's Buy 1, Get 1 Free - Eckert's Country Store & Farms, located in Belleville, IL, will be celebrating National Pie Day with a buy one pie, get one of equal or lesser price for free on Jan. 23, 2014. Plus, all other desserts will be a buck a piece, too! Doughbox Bakery Deals - The Doughbox Bakery in Sauder Village will be servin' up free samples and $1 discounts off pies on Jan. 23 from 7:00 a.m. - 5:00 p.m., while supplies last. Noble Pies - If you're looking for a family-friendly activity to do this weekend, head on over to Noble Pies in Warwick, NY, for free samples, drawings and pie-eating contests for kids and adults on Sun., Jan. 26 starting at 3:00 p.m.
Hopefully there is FREE pie somewhere near you! I found some fun pie "fact" which I thought you might enjoy . . .
27 - percentage of Americans who say apple is their favorite pie. 37 - percentage who must have whipped cream on top of their pie. 17 - percentage who have tried to pass off a store-bought pie or crust as homemade. I am DEFINITELY in the percentage who must have whipped cream on top of their pie! If I were at a "pie buffet", I'd very likely reach for the pumpkin pie first . . . unless they also had blueberry . . . or peach . . . or banana cream . . . or coconut cream . . . or, well, you get the idea . . . I do enjoy pie! Which kind of pie is your favorite?